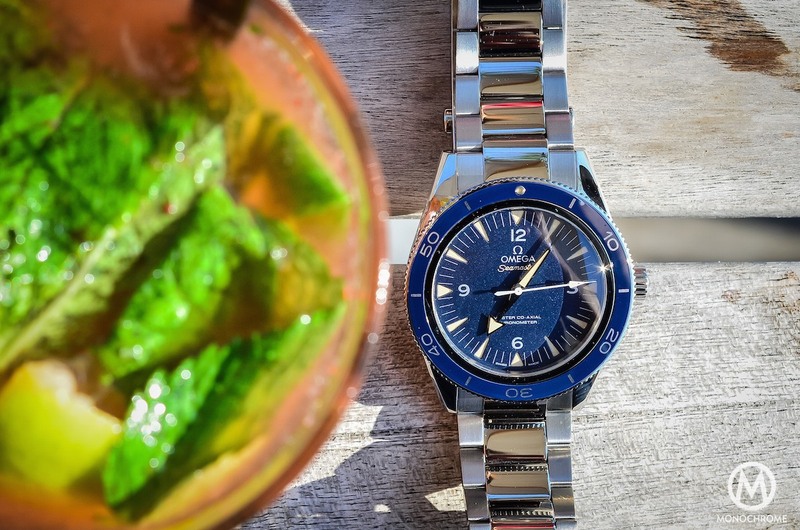 The new Omega Seamaster 300 Master Co-Axial… THE star of Baselworld 2014, a truly inspired watch with its superb vintage design, a great horological content, and the introduction of a fully anti-magnetic movement! We’ve covered it multiple times already on Monochrome (here and here). After all the noise created around this timepiece, it was clearly time for us to use it, to feel it, to show it. 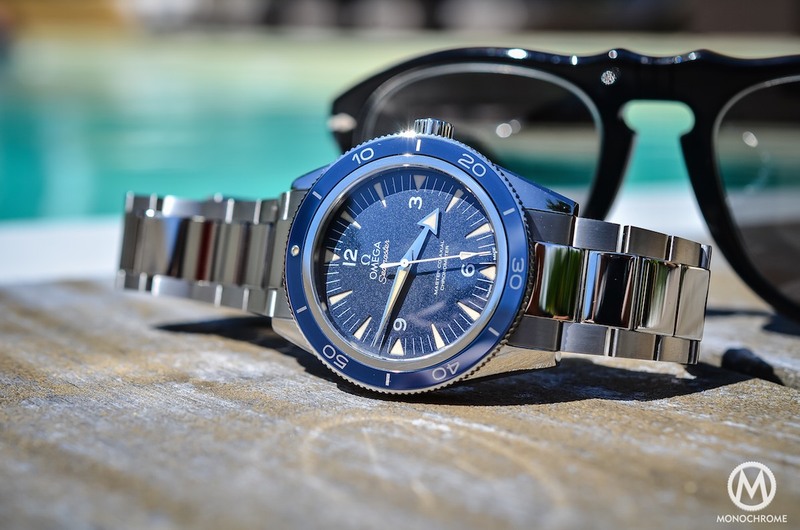 Well, we’ve been testing the Omega Seamaster 300 Master Co-Axial in titanium over the space of a whole summer. 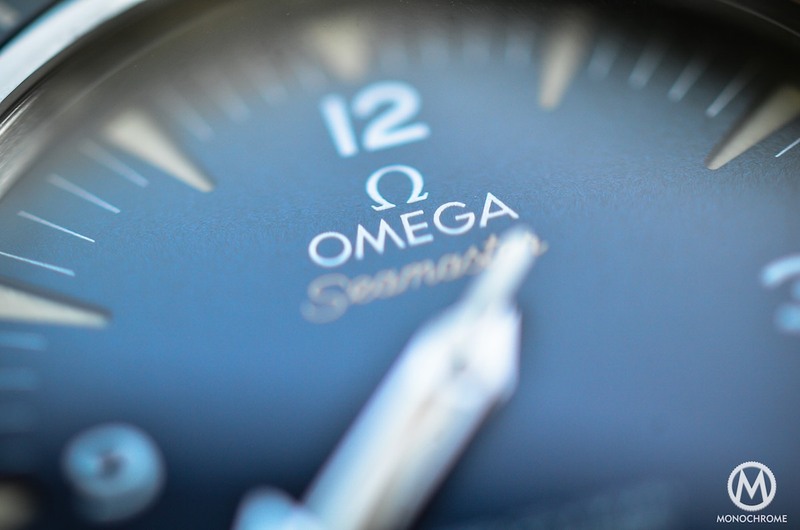 Omega surprised us just before Baselworld 2014, with a teaser showing a new dive watch. You know us here at Monochrome-Watches, we can’t resist opening our photo-editing software and to imagine the future novelties. So, we’ve predicted this new watch. 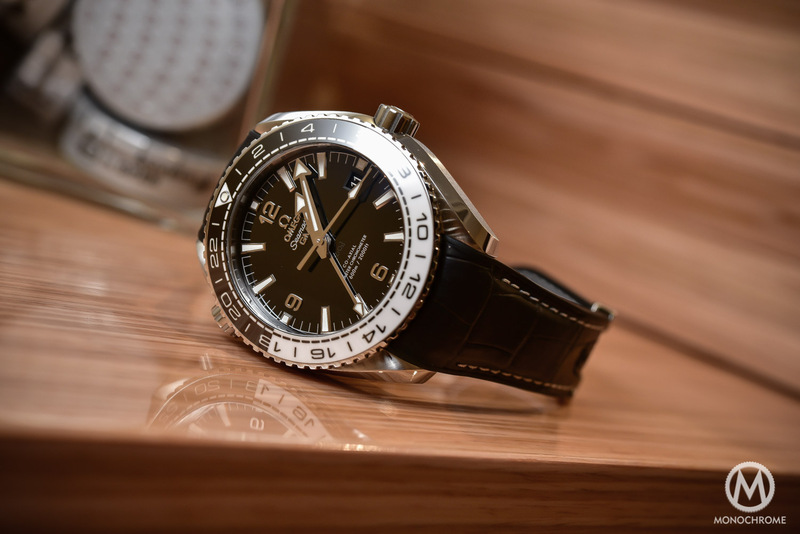 The impatience was great before the annual watch fair, as we knew Omega was cooking something cool. The result was beyond our expectations, with a superbly designed watch which had been inspired by one of the brand’s greatest diving tools and not only that, but a movement to match too. We played for a while with it during Baselworld, but it was not enough. The full review was necessary. 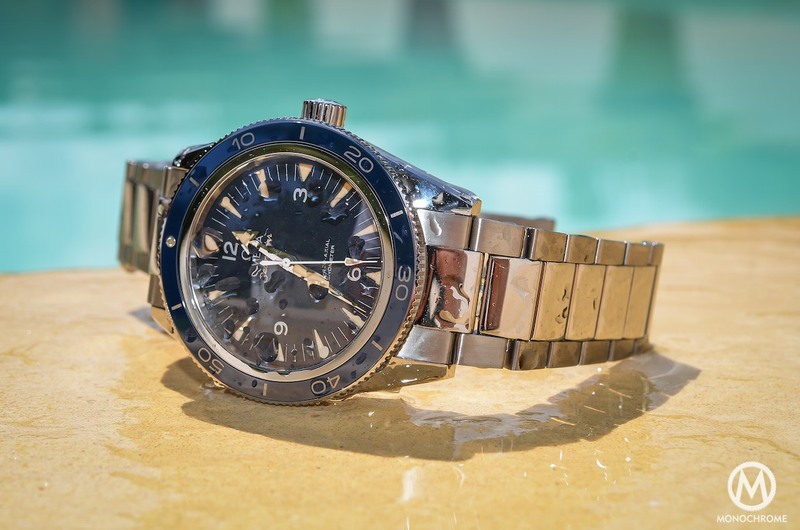 We picked up the watch from Omega just before the summer-break and brought the Seamaster 300 right to the place it belongs to: seaside. Before giving you our impressions, we need to get back in the past and see the lineage of this timepiece. 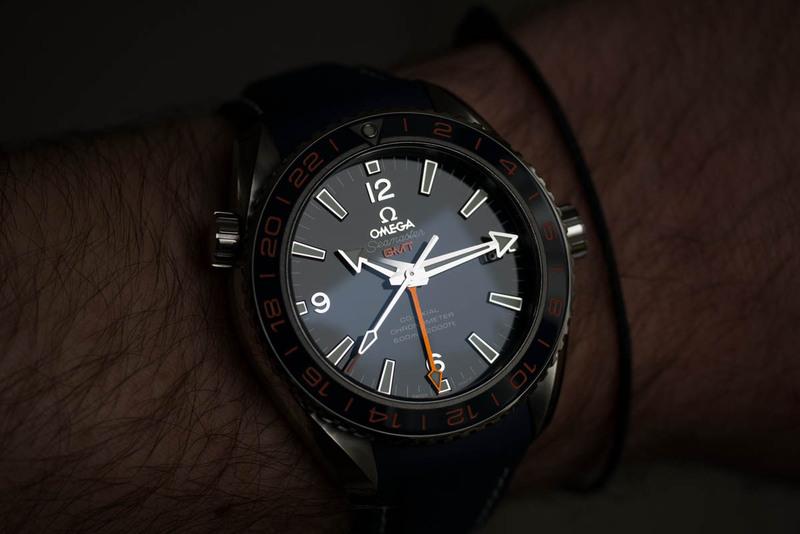 This image made by Omega is perfect to see how similar these two watches actually are, but it also helps to show the multiple differences between them. 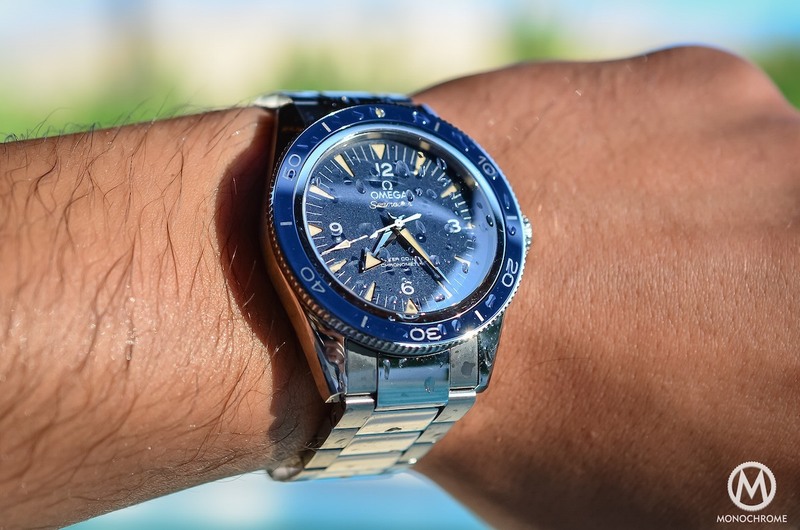 The original was introduced in 1957 (alongside 2 other watches, the Speedmaster CK2915 and the Railmaster CK2914, as part of a professionally-oriented collection). It was Omega’s answer to Blancpain with its Fifty Fathoms and Rolex with its Submariner (both introduced in 1953). Omega however presented a watch able to resist to 300m, with a superb design and a reasonable size. 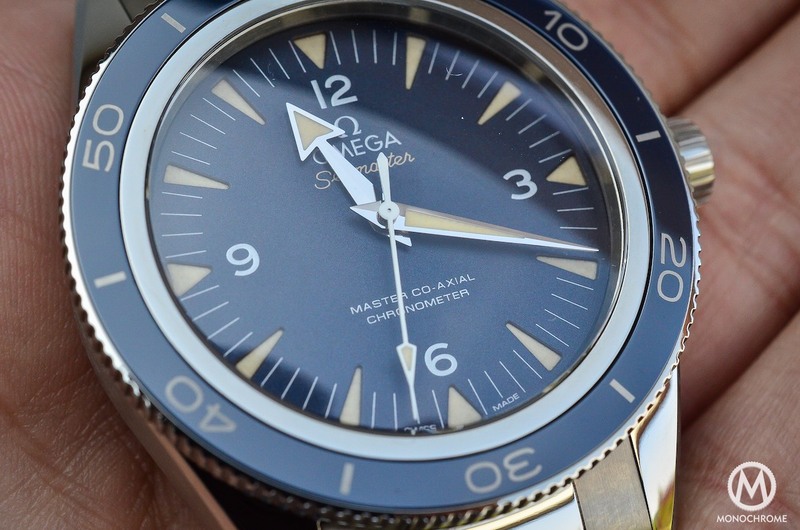 Omega could have stopped here, by just reinterpreting the design and then cased a simple movement inside. They could have also use the same recipe than as they did with the Speedmaster Mark II, by modernizing an iconic design. 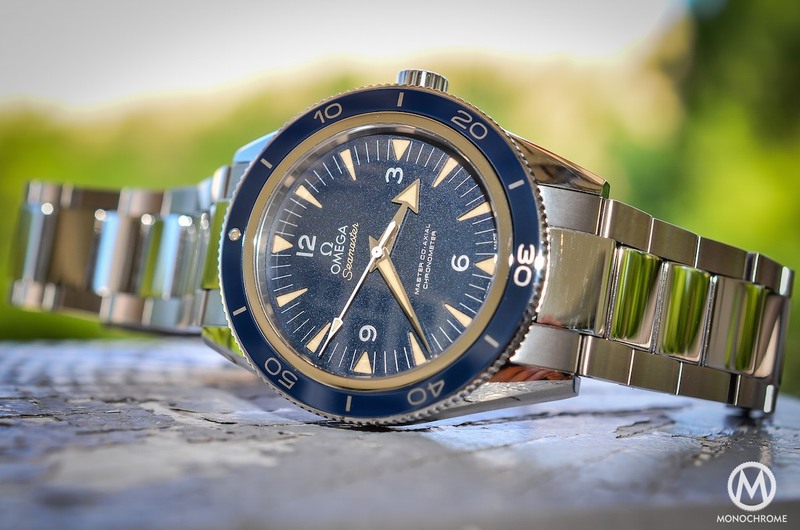 Instead, Omega went one better: using the classical codes of the old Seamaster 300m, modernizing its appearance and cased inside a very innovative movement. 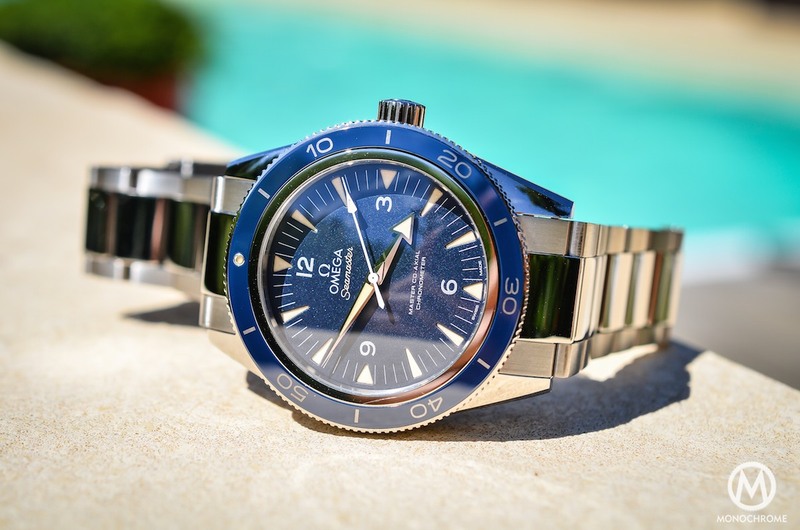 The Omega Seamaster 300 Master Co-Axial is not just another re-issue; it is the modern icon. 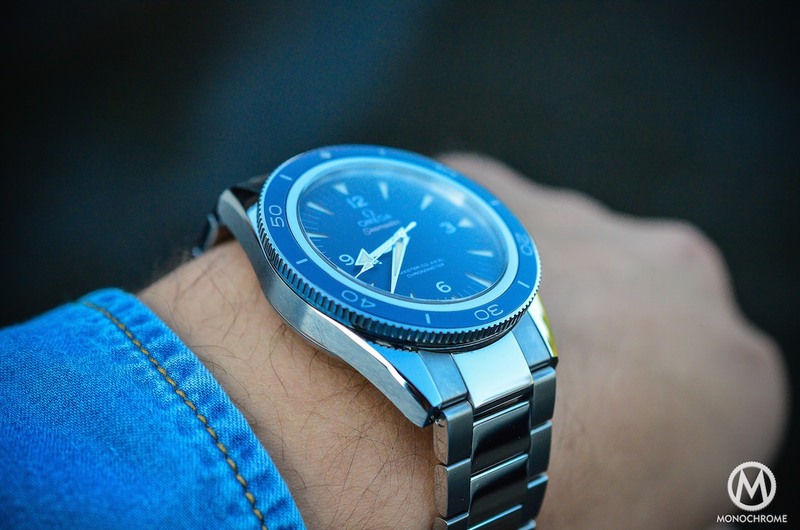 For this review, we chose to go for the Titanium edition, with its blue dial; a combination less usual than the classical steel/black version, but one that delivers quite some advantages: lighter case, great resistance to corrosion and scratches and added exclusivity with this cool dial (the blue dial is only available with titanium). All of this was truly welcome, as we’ve worn the watch throughout the summertime and used it as a diver watch should be used. 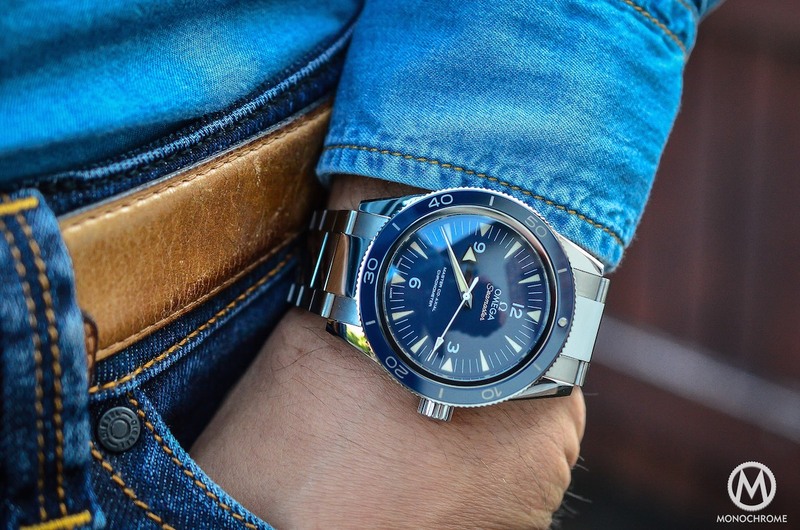 The overall partition is extremely simple: the Seamaster 300 Master Co-Axial is a dive watch. No need of useless features here, just the required one: hours, minutes and seconds for the indications (no date window that pollutes the dial), 300m water-resistance, screw-down crown, unidirectional rotating bezel and bracelet with easy fine-adjustment. Putting aside the specifications of the movement, that’s all you’ll have. And clearly, that’s more than enough. 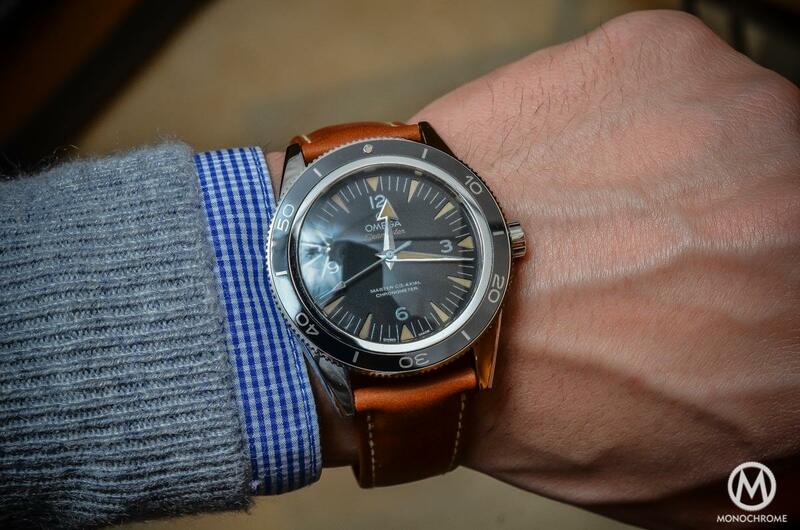 The Seamaster 300 Master Co-Axial might have a vintage design; it remains a practical tool and a modern diving watch. 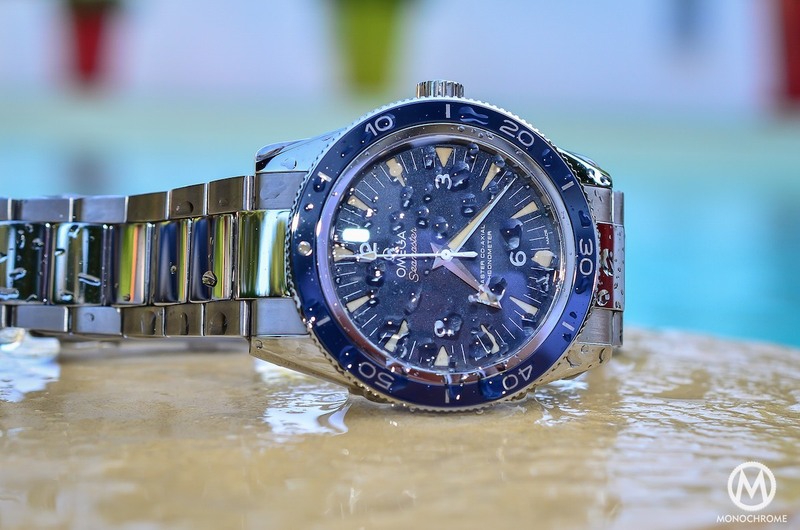 It can be used unrestrainedly as a tool watch – and we can guarantee that to you, as the watch has been used to swim, to dive, to sail and to lie down on the beach. Of course, using the SM300 as a daily watch with your business suit won’t be seen as an act of treason. If the PR photos and a quick look at the case might give you the idea of a simple re-edition of the vintage watch, the reality is different. For sure, the design is similar, as well as the diameter, that remains reasonable at 41mm. But the quality (based on 2014 standards) and the proportions are slightly different though. First, we chose to go for titanium. 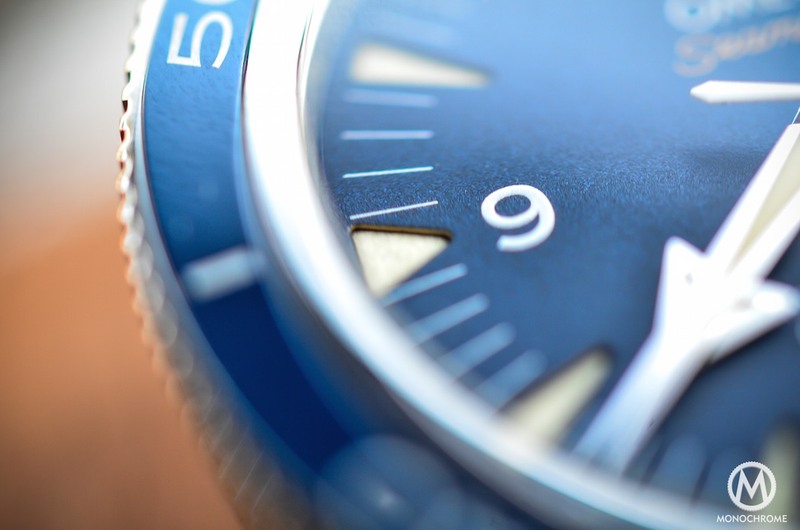 Not only because of the blue dial but it also has several advantages compared to stainless steel. The first one is of course the weight, with a reduction, which is close to 30%. Whilst the watch may come on a bracelet it remains extremely light and so, comfortable too. The use of grade 5 titanium allows the watch to have some mirror polished surfaces (something that is not possible with grade 2 titanium, always sandblasted or brushed) and a very bright colour (not so different from steel, just a little darker). Titanium is also extremely resistant: it scratches less easily than steel – which is appreciable with polished parts – and is extremely resistant to corrosion. Thus, the Seamaster 300 in titanium is stronger together with being more comfortable. A choice that we clearly appreciate here – the only issue is the price, as the titanium edition is 1,800 euros more expensive than the steel edition. The case is thus reasonably sized in terms of diameter, as was the vintage edition. However, the main difference with the old Seamaster 300 is the thickness. The case itself is not thick. As you can see, the casebands are quite thin. However, the bezel is thicker. 2 consequences to this design choice: the practical aspect is improved, as the bezel will be easier to grab, even with diving gloves. However, the visual aspect does not benefit from this increased thickness – nothing alarming though, but a bit of thinness is always welcome, especially for vintage-inspired watches. Talking about the bezel, we have to recognize its quality. The clicks are strong but pleasant and the adjustments are precise. The blue part is made of (virtually) unalterable ceramic. The colour will remain strong forever and without scratches. The surface is smooth and flat. The numbers are made of liquidmetal, a unique alloy that bonds seamlessly with ceramics. The rest of the case uses several techniques: the casebands are brushed, the edges of the lugs come with a shiny but beautiful bevelled angle and the horizontal parts are mirror polished. The execution is clean, precise and coherent with the price. The bracelet, also made of titanium, presents the same specifications as the case: extremely well made, perfectly adjusted, comfortable and smooth. It even comes with a very intuitive and simple fine-adjustment mechanism (only press a pusher inside the clasp to adjust the length). But this qualitative feeling is linked to an issue, the same as the case: thickness. The bracelet and the clasp are quite massive and could afford to loose 1mm or 2mm. Once again, nothing dramatic but the elegance might have been greater. The bracelet was also at the centre of a debate around this watch: in particular the mirror polished central link. To be very honest, we can see it from two angles. If we look at the Seamaster 300 Master Co-Axial as a pure tool watch, a fully brushed finish would have been more appropriate. However, the vintage feeling and design-oriented intention of this piece justified this mirror-polished centre link. And titanium helps to keep it clean. The dial – in black or blue – is also quite a piece of attraction. 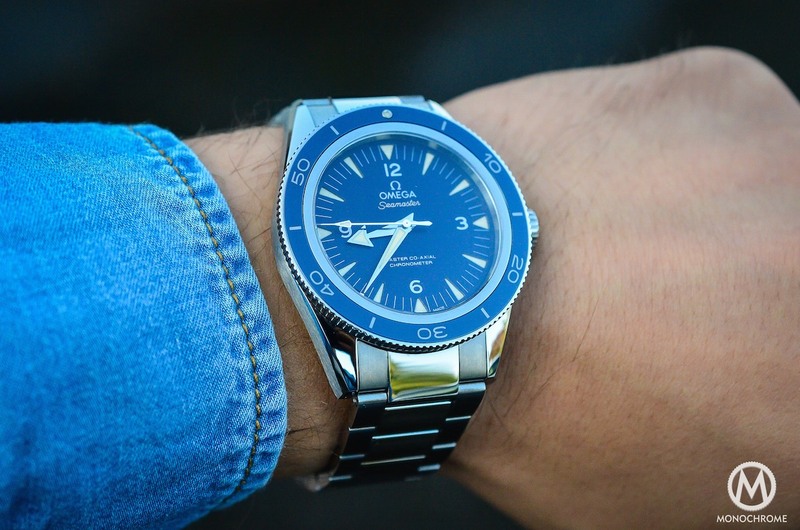 It uses the design codes of the previous Seamaster 300m CK2913. The base plate is textured and matte, which helps to have a great legibility, especially in sunlight (the anti-reflective treatment of the domed crystal is also extremely efficient). The hands and indices are always easy to read due to the contrast of this matte finish. The hands are typically Omega, with the broad-arrow shape: a sword minute hand and an arrow hour hand. Both are made of polished steel, with luminous material. The second hand might seem out of place however, with its diamond shape and its colour. On an historical basis, this hand is not relevant, as the SM300 CK2913 originally came with a simple baton hand in steel, without luminous material. This type of hand came later, on the second generation of SM300. The white lacquer might also be intrusive in this context, but I get used to it and found it nice after a while. It gives echo to the numbers and logo on the dial. The indices are quite particular. At first, we thought the dial had a sandwich-construction. However, the dial is cut by laser to remove some material and create some cavities, which are filled with luminous paste. This creates a nice depth effect and prevents the dial from being too flat. The luminous material has a faux-patina aspect, with a yellow / brown colour to recreate the effect of the age on tritium (the radioactive material used in vintage watches and that tends to turn brown when aging). The dial is lively, legible and clean – Omega had the good idea to limit the amount of inscriptions on the dial. 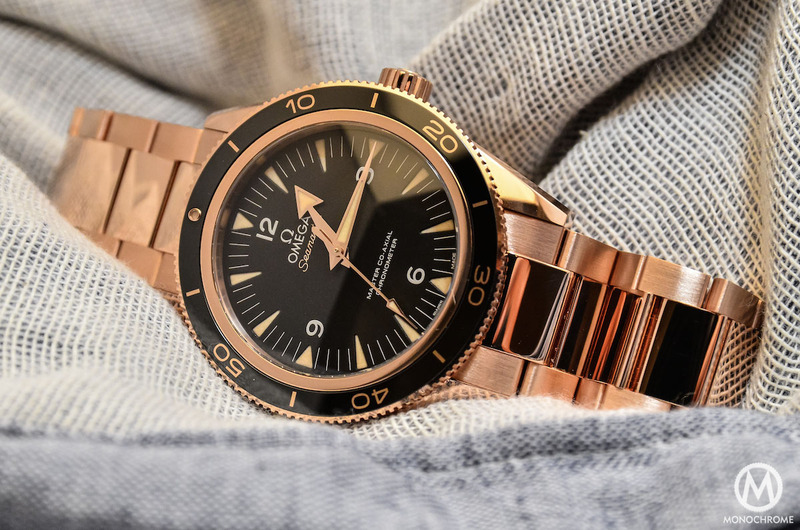 If the shape of the Omega Seamaster 300 Master Co-Axial is clearly influenced by a vintage edition, the movement is far from being stuck in the past. Inside the SM300 ticks Omega’s finest and most innovative calibre, the 8400. We already covered it in March, just after Baselworld, but another piece of news came recently: the METAS Certification. We’ll get back on this later. First, we have to understand what the Calibre 8400 Master Co-Axial is. This in-house movement comes with all the innovations made by Omega during the last years. 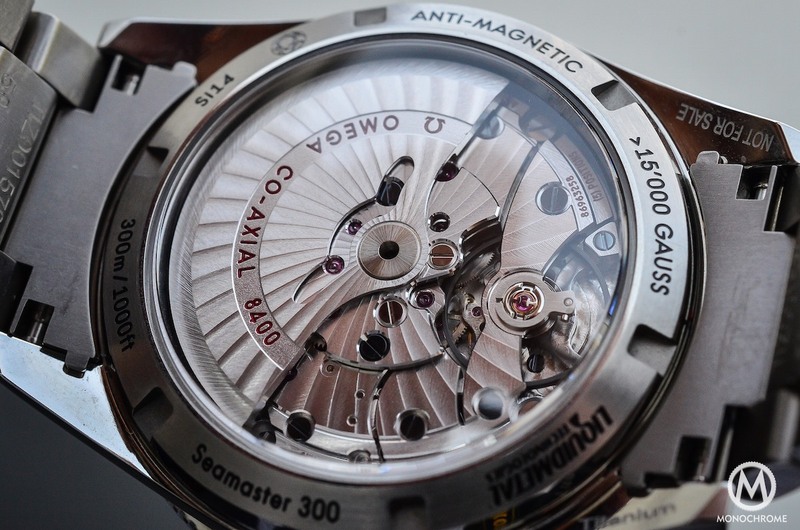 It has the Co-Axial escapement created during the 1970s by Georges Daniels. It is supposed to have reduced frictions, to have better chronometric performances and to require less service operations. Then, it comes with truly antimagnetic properties – it is not an external protection against these fields as the movement itself is resistant to magnetic fields up to 15,000 gauss. The escapement, balance wheel and spiral are made of silicon, the steel plates have been replaced with non-magnetic plates and the spring of the shock absorber has been crafted from an an-amorphous material. All the parts that should definitely stay clear of magnetism have been replaced by anti-magnetic materials. Impressive! 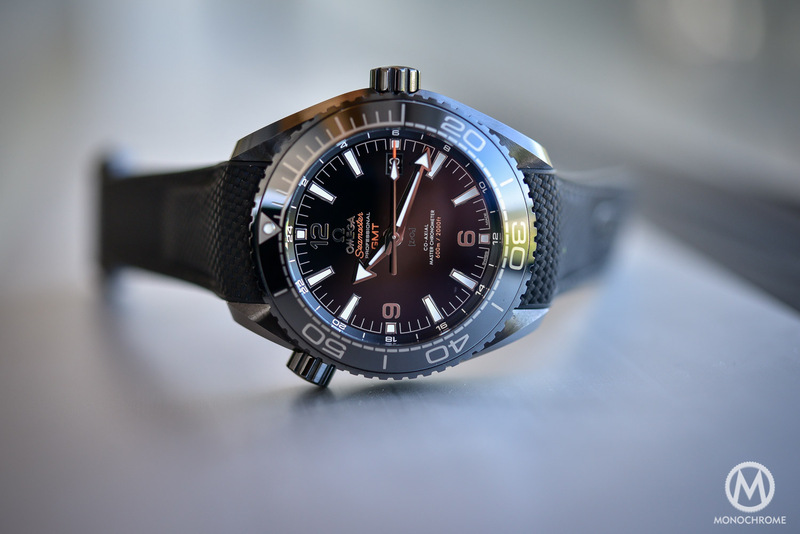 Omega is so confident in its movements that it comes with a 4-year warranty. 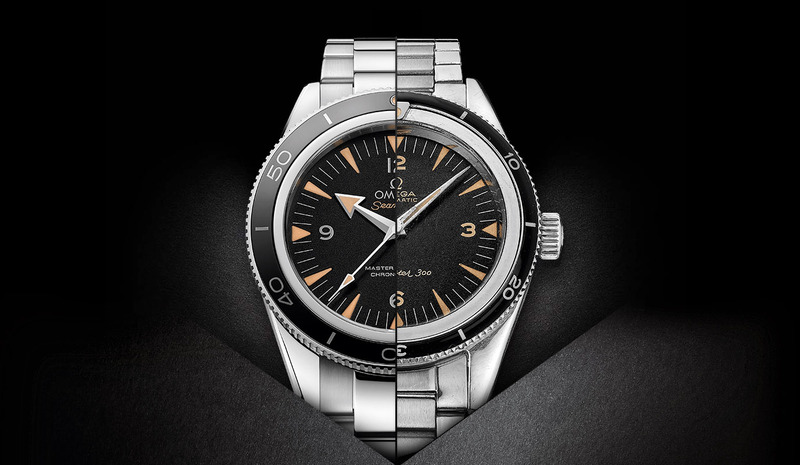 The Calibre 8400, when presented during Baselworld, was said to be certified by COSC. Something has changed in the last few days, as Omega just introduced a brand new certification, together with METAS, the Swiss Federal Institute of Metrology. METAS will test and certify the testing procedures and machineries, which will be used to perform the tests in-house by Omega. It means that the certification will be done on assembled watches and not just on the movements (thus also including water-resistance and antimagnetic properties tests into the process). Omega and METAS announced that movement will only receive the Chronometer Certificate, if they perform between 0 and +5 seconds deviation per day (vs. -4s / +6s for the COSC). All together, these specifications create an impressive movement: reliable, precise, resistant and highly innovative. The finish is also pleasant with (machined) anglages on the bridges and Geneva Stripes in Arabesque. The power reserve is also comfortable, with 60 hours of energy. Putting aside the (minor) issue of the thickness (case and bracelet), the Omega Seamaster 300 Master Co-Axial is really pleasant on the wrist. As we told you, the choice of titanium is really something we would encourage here, as the comfort is really improved. This is not the same with a stainless steel edition, which is far from being unpleasant but still, heavier. (We are not even talking about the platinum edition that weights more than 400 grams). The shape and size of the case are also great. It remains reasonable enough for small wrists (like mine) and the lack of crown protection is elegant and allows reducing the perceived size. We also tried the SM300 on a Nato strap (something that the future owners will certainly do as well) and it really changes the style of this watch. It really gives the watch a vintage look. The official Omega Nato straps will be right in place here (one minor issue however, as the bracelet measures 21mm and Nato straps usually measure 20mm). 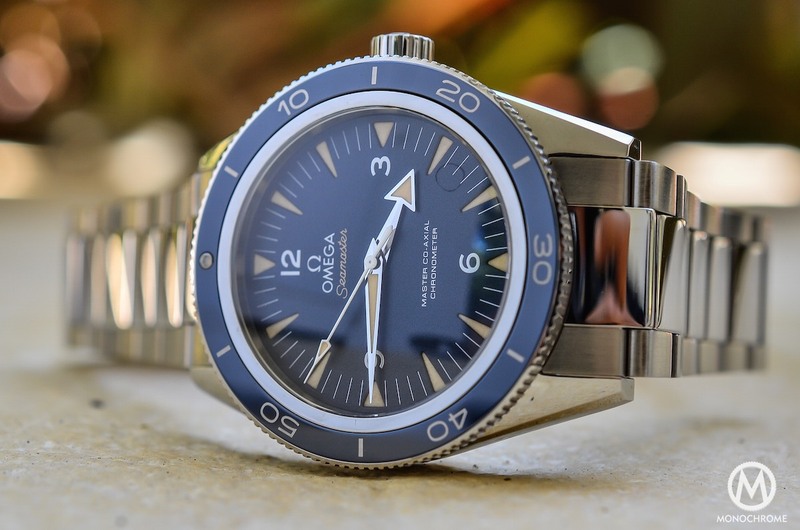 The Omega Seamaster 300 Master Co-Axial was much anticipated by collectors. Omega was clearly not allowed to do a single mistake with this watch. Not only did they manage to do this, Omega pleased us with a superb and inspired design, with very cool details (hands and indices) and a high quality construction, but they pushed the concept still further with this truly amazing movement. Now, we have to compare the SM300 to its largest competitor, another icon of the dive watches, the Rolex Submariner. The latter is clearly not playing on the vintage trend and goes for rigor. Both are equally well finished, both have an in-house calibre, both can be used as proper diving tools. The Omega however clearly stands out with its antimagnetic movement (Rolex cannot compete here, even with the Milgauss). The specs are clearly on Omega’s side. Design-wise, it is certainly more a matter of tastes than an objective choice. The price however is another story. The Rolex Submariner no-date Ref. 114060 is priced at 6,000 euros. The SM300 in steel is priced at 4,950 euros (6,750 euros in titanium). 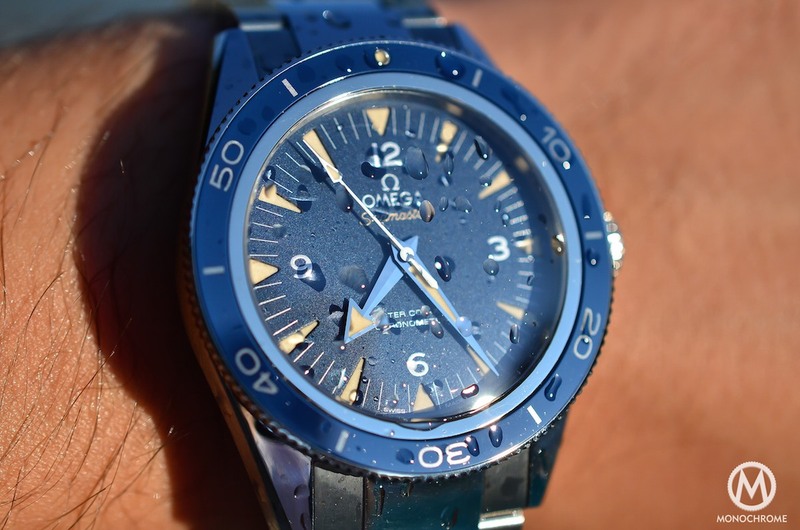 And here, in all objectivity, we have to admit that Omega has a clear advantage considering the technical package. So where did you find a 21mm Nato strap? Or did you use 20mm instead? We used a 20mm NATO strap. A 21mm strap does not exist and will have to be custom made. A 21mm NATO strap does exist. 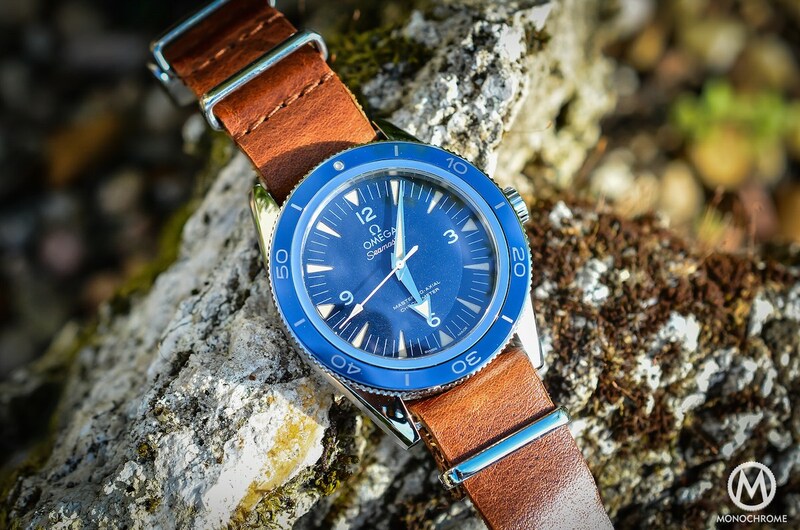 Omega are producing a coated black nylon and brown Barenia leather NATO in 19mm, 20mm, 21mm and 22mm. What is your wrist size, if you don’t mind me asking? It seems to fit perfectly on your wrist. No. Omega does not produce 19 or 21mm. They say that 20mm straps fit all watches between 19 and 21 mm. 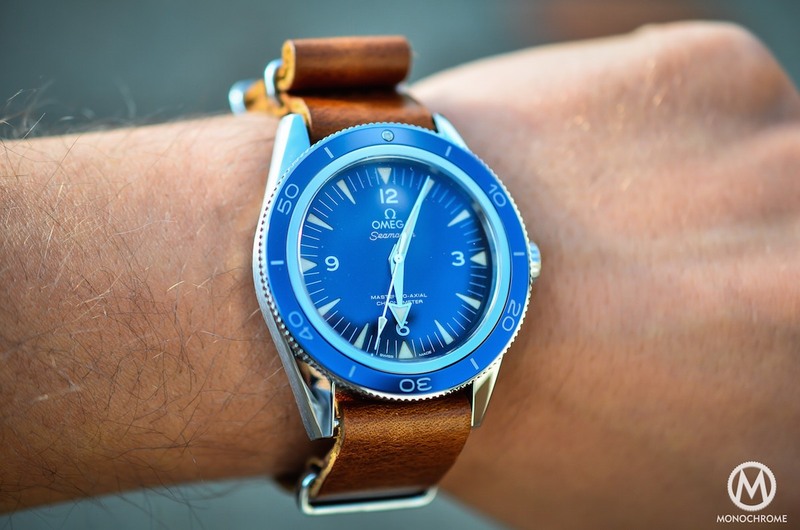 SLF 41 – Omega make 19mm, 20mm, 21mm and 22mm NATO straps in Barenia Leather and coated black nylon with nylon retainers. The 19mm to 20mm striped NATOs and 21mm to 22 mm striped NATOs are not specifically sized. On that point you are correct but on the point I made you are wrong. Do your research. On the older lume, the active radioactive nuclide was radium, not tritium. The base material was a zinc sulfide which did suffer radiation damage with time – it was eventually destroyed by the alpha particles before the radium had time to decay away significantly. Tritium was used in a paint form beginning the late 60’s or early 70s as phobias spread about radioactive materials. 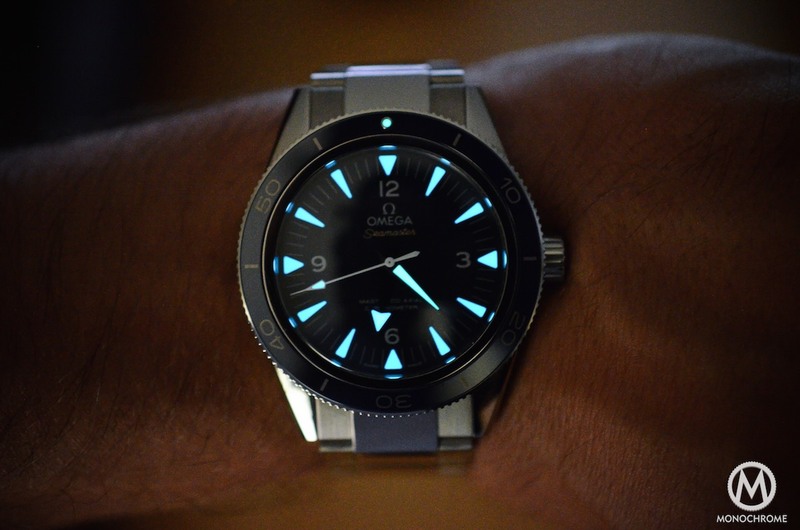 The current technology uses low energy beta particles from tritium, sealed in tubes with the lume. I don’t see that included here. Granted that the new sealed tritium sources are a definite technical improvement although the tubes do limit the styling options. 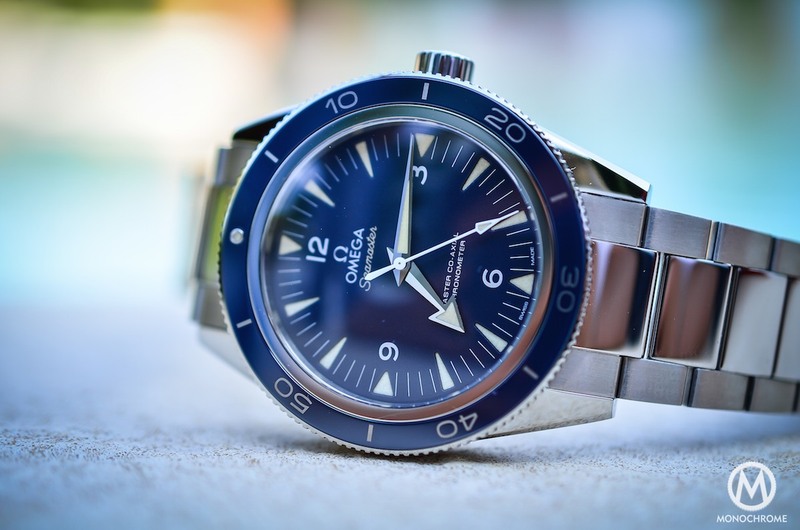 Stay away from the Omega watches if you are looking for actual functionality; they look great, but are lacking in reliability. My Titanium SeaMaster Automatic is now inoperable as the insides have rusted. 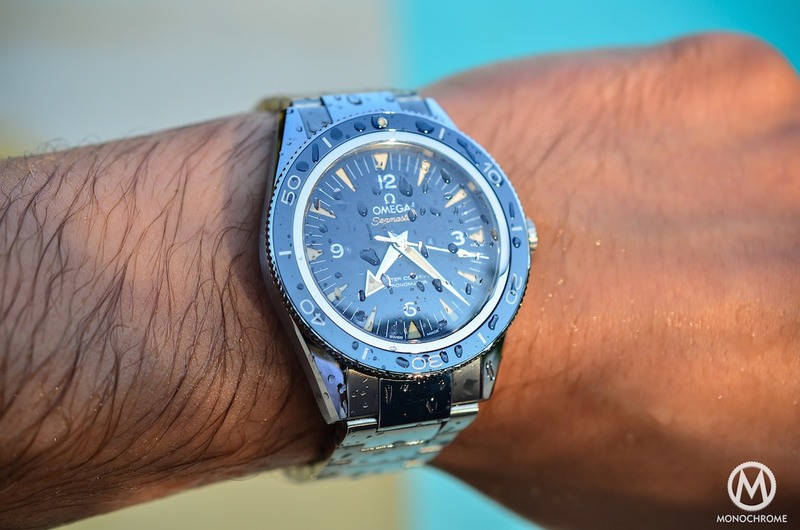 As Omega has informed me, I was supposed to have it services annually by the Omega Service facility (for just over $350/year) for it to retain its water resistance. (It’s never been deeper than the backyard pool.) Further, the lack of function of the stopwatch feature is due, I have been informed, to the vibration the watch experienced while worn at my job (I am a helicopter pilot). Again, not backed by Omega. Bottom line, they want $1700 to repair the watch, with the caveats that I service it annually, and do not fly with it, for it to retain its functionality. Looks like on the wrist of an actor is appropriate. Brice, how big is your wrist? It fits you just perfect. Wondering if it will fit on my 6.5 inch wrist for everyday use..
Hello Dax, my wrist is also 6.5 inch, just like you. So it could sit very nicely on your wrist too.